If you were to Google the references to infant baptism in the New Testament, you would perhaps be disappointed, maybe even a little shocked. Though Jesus took children in his hands and “blessed” them (Matthew 19:13), and though there are several New Testament references to “whole households” (Acts 16:15, Acts 16:33, 1 Corinthians 1:16) being baptized—which one would assume would include infants and children—nowhere do we find an imperative that baptism occur early in life. Why, then, does our church encourage the early baptism of our little ones, to the point of cherishing infant baptism, baptism in the very earliest days of life when our tiniest can do nothing other rest safely, as the old hymn suggests, against not only our own shoulders but against the very bosom of God? That promise part? That’s something to which we need to pay particular attention. There, hidden though it may be, lies our stake in getting our babies—and anyone else, as far as that goes!—up to and through the font. We want them to get what God gives in the sacrament of baptism and get it as soon as they can—not because hell is hot but because life is so often cold, cold to the bone cold—lonely, isolating, full of judgments and pain. It is such, sadly so, even from the earliest of ages. And truthfully, sad to say, it is sometimes because of our own not-so-helpful choices. Because we are promised in the waters of baptism that behaviors that could consign us to guilt, condemnation and shame in this life are stripped of that power. No string can be connected between what we have done, or worse, that might come our way, and the presence of pain. Christ promises to give freedom in the holy flood. A child is baptized under the waters and “dirt” is washed off—and all prior to playing in the mud! We are given the hope of what our Apostles’ Creed calls “the resurrection of the body and life everlasting.” The babies and children we bring to the font will, we pray, have years and years of life. But when the last darkness comes, there, like a pillar of fire, is the hope: “after my skin has been thus destroyed, then in my flesh I shall see God” (Job 19:26). So we baptize those babies—as well as anyone else starving for the promise—to give them light to see as ashes come to ashes, dust comes to dust. In baptism we are grafted into a family—the church, the body of Christ, “the communion of saints.” We have a whole body around and about us, our brothers and sisters, the baptized. They belong to us as we to them. They are called to whisper the promise that we are one with each other even when life divides. 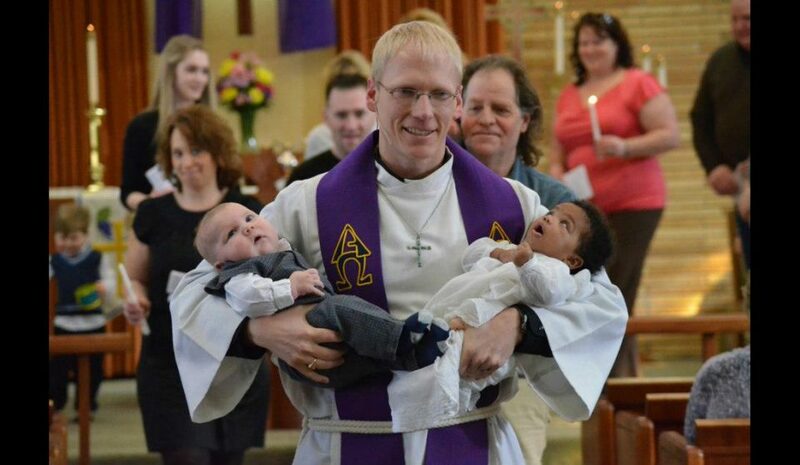 Why baptize little ones? For the same reason all the saints are invited to come down to the waters: so we might come to know Christ and his gifts for what they are—our own, through all that life might bring. That water dripping over even the tiniest brow? It, by Jesus’ word, promises nothing less.